In Chap. 2, the decentralized charging method has been designed to effectively coordinate the charging behaviors of large-scale PEVs, like the valley-filling strategy, to minimize their impacts on the power grid. However high charging rates under the valley-filling strategy may result in high battery degradation cost. 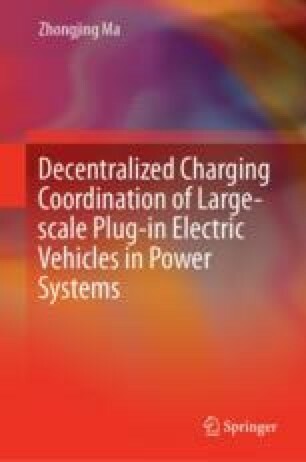 Consequently in this chapter, it formulates a class of PEV charging coordination problems which deals with the tradeoff between total generation cost and the accumulated battery degradation cost of PEV populations. Due to the autonomy of individual PEVs and the computational complexity of the system with large-scale PEVs, it is impractical to implement the solution in a centralized way. Alternatively in this part a decentralized method is proposed such that all of the individual PEVs simultaneously update their own best charging behaviors with respect to a common electricity price curve, which is updated as the generation marginal cost with respect to the aggregated charging behaviors of the PEV populations implemented at last step. The iteration procedure terminates in case the price curve does not update any longer. It has been shown that, by applying the proposed decentralized method and under certain mild conditions, the system can converge to a unique charging strategy which is nearly socially optimal or efficient. Simulation examples are studied to illustrate the results developed in this chapter.